Coming from Koblenz take the Deutsche Bahn train (RE/ RB) with direction Mönchengladbach, get off the train in Bad Hönningen train station and from here it´s only a 15min cap ride to Waldbreitbach. Waldbreitbach is located about 16 km north of Neuwied, and West of junction 36 of the A3 motorway. Coming from Bonn it´s only a 40min ride. Coming from Koblenz (30min) take the B9/ B256 follow K108 in Neuwied. Then take the exit NR-Oberbieber/Melsbach/NR-Niederbieber on B256 to Waldbreitbach center. Coming from Bonn airport it´s only a 45min ride. Take the A3 and follow the K78 in Neustadt (Wied), take exit 35-Neustadt/Wied and follow the signage to Waldbreitbach center. In the heart of Wiedtal valley and surrounded by deciduous and coniferous forests lies the beautiful old, historically significant Waldbreitbach. The quiet, peaceful atmosphere invite to linger longer. The romantic Wiedtal is the ideal place for holidaymakers, nature lovers and everyone who loves active holidays. A versatile variety offer a constantly changing programme of cultural events and an extensive program of excursions to the nearby destinations of the Rhine, the Moselle river and the Lahn river. The federally recognized air spa, Waldbreitbach is a perfect place to visit. The wonderful historic center with it´s half-timbered houses invites for a relaxing stroll through the winding streets or a rest in one of the cozy cafe´s. The Wied is the longest river in the Westerwald and flows right through the wonderful town of Waldbreitbach. The river winds from the source in Linden on the Westerwald lake plateau to its confluence with the Rhine in Neuwied by low mountain range. Best way to discover nature and the enchanting landscape is hiking. We recommend to start the exploration at the Wiedweg hiking trail (also, Wiedwanderweg). The trail starts right at the source of the river the "Wiedquelle", on the outskirts of Linden/WW (470 m) and from the high Westerwald, it goes in a broad arc to its confluence with the Rhine in Neuwied (55 m). Over at the Lake, through the still-wide landscape of the Westerwald, the Wied at Altenkirchen is slowly becoming a wide stream. Downhill, until after Altwied, the Wiedweg hiking trail remains, now increasingly in the Wied Valley. Up on a few strong climbs to the surrounding heights, the route runs mostly on the slopes and paths of Wiedtal valley. By Altwied about Niederbieber up to the Wiedmündung at Neuwied sports remains the trail often in terms of the places. The Wiedweg hiking trail was awarded 2010 by the German hiking Federation quality way „Wanderbares Deutschland“ (walkable Germany), which emphasizes its unique hiking quality. It is divided into eight sections and can be hiked individually. The Wiedweg is a "modern classic" among the Westerwald hiking trails. Visitors are led by the beauties of the Westerwald range now as nature and close to the water. Up and down it goes through meadows and forests with unforgettable views of the 106 km long Wiedweg hiking trail. The Wiedweg offers perfect outdoor fun on a well marked trail and even besides the quality trail, the region has a lot to offer. Before heading out, seek for local advice - Touristik-Verband Wiedtal e.V., Neuwieder Straße 61, 56588 Waldbreitbach, www.wiedtal.de - the office will help to find a route to match your fitness and time frame and can supply you with maps and further instructions about the hiking trail and it´s breathtaking surroundings. Tip: Visit Waldbreitenbach in winter, when the wonderful town turns into a christmas wonderland. From the 30.11.2014 to the 2.2.2015 Waldbreitbach in the Wied Valley presents itself again as Nativity village with many attractions, exhibitions and cribs tracks. The "Christkindchenmarkt market" is held on the 2nd and 3rd weekend of Advent. Visit the "International provision and Bible Museum" of cribs Gustel Hertling Baumeister at the start. Here visitors can admire over 2,200 cribs from all over the world. The Westerwald-Steig is the No. 1 hiking trail within the Westerwald hiking paradise. Interesting sights, breathtaking viewpoints and always changing landscapes accompany the 235 km long Westerwald-Steig. Starting from Herborn the Westerwald-Steig leads to Bad Hönningen am Rhein, in 16 stages between 6 and 23 km. Along fascinating sights, nature lovers find everything their heart desires - enjoy on 235 km breathtaking lookouts and always changing landscapes. There are numerous hotels with a TOP cuisine in the Wiedtal valley. Many restaurants offer also local "Julie cuisine" or regional herbs wind products. Whether for lunch, coffee & cake or end an eventful day in the village of Nativity scenes - here everybody finds the right place. Explore the surroundings by boat and enjoy a relaxing day on water. Free parking is available at the Wiedtalbad in Hausen / Wied. From here, you walk down a piece of the Westerwald-Steig to Waldbreitbach. The boat rental with beautiful Sun terrace offers from April October rowing and pedal boats, as well as drinks, ice cream & snacks on (daily 10.00 - 21.00). Nearby is a large children's playground directly at the Wied shore. Your "private" Hotel between Cologne and Koblenz. Far away from city stress. 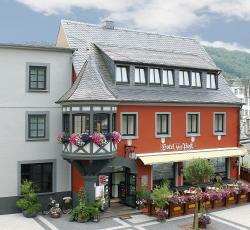 Enjoy the warm and friendly atmosphere of the Rhein-Hotel 4-Jahreszeiten. 168 comfortable rooms as well as 11 furnished bungalows for up to 6 persons. This 3-star-superior hotel in Waldbreitbach offers a free sauna, free parking and free Wi-Fi in all rooms. It is located in the Wiedtal Valley, in the Westerwald Forest. Situated on the River Wied in Waldbreitbach, this 3-star superior hotel offers an indoor pool, spa facilities and free Wi-Fi. Vita-Balance-Hotel Hertling also has a sauna and a fitness area.